Q: It is reported that a bus carrying 31 Chinese tourists crashed in the province of Antalya, Turkey on July 29, leaving many tourists injured. Can you offer us the latest information regarding the handling of the accident? What effort has the Chinese side made to rescue and help the tourists involved? A: On July 29 local time, a bus carrying 31 Chinese tourists crashed in the province of Antalya, Turkey. According to the information we have now, the Chinese tourists were injured to varying degrees and three people suffered relatively heavy injuries. After the accident, the Chinese Embassy in Turkey and the Chinese Consulate-General in Izmir immediately activated the emergency response mechanism and asked the local police to find out the cause of the accident as soon as possible and the hospital to make utmost efforts to treat the injured. The Chinese Consulate-General in Izmir has sent officials to visit the injured and actively offered assistance to them. Recently, there have also been security accidents involving Chinese tourists in other countries. The Foreign Ministry and the Chinese diplomatic missions in relevant countries actively responded to these emergencies, immediately contacted the competent authorities and went all out to safeguard the legitimate rights and interests of Chinese citizens. I would like to remind you once again that the summer vacation is a peak season for Chinese citizens to travel abroad and the travel safety can by no means be neglected. You are kindly suggested to raise safety awareness, prudently choose tourism services, properly arrange for your agenda and bear in mind the traffic safety as well as safety in other aspects. Meanwhile, you may check on the consular service website of the Foreign Ministry (cs.mfa.gov.cn), the "China Consular Affairs" account on WeChat (Ls12308) and on Weibo for information on safety alerts and travel advice. In case of emergency, please immediately call the local police. You can also dial the 12308 hot-line (86-10-12308) of the Chinese Foreign Ministry's Global Emergency Call Center for Consular Protection or contact our embassies and consulates overseas to ask for help. The Foreign Ministry and the Chinese diplomatic missions abroad will continue with their efforts to coordinate the local competent authorities to take effective measures to provide a safe environment for Chinese citizens' outbound trips. Q: According to reports, the hydropower dam break in Attapeu province, the Laos has so far still left more than a hundred people missing and over 3000 homeless. Have you received any report of Chinese casualties? Has China made any rescue efforts? A: I gave you a glimpse of the relevant situation last week and I would like to update you on that here. First, according to the information at hand now, we haven't received any report of the casualties of Chinese citizens. Second, the Chinese government has urgently provided much-needed humanitarian aids and supplies to the Laos, including charge boats, tents and water clarifiers, which are very useful in disaster relief operations. Third, the Chinese enterprises and communities in the Laos and the Chinese non-governmental rescue teams have also assisted in the disaster relief efforts there. China will continue to provide its utmost support to the Laos if necessary and help people in the disaster-stricken area to get through difficulties and rebuild their homeland. The Lao government and people have thanked China for the responsive and effective assistance they received. They said "a friend in need is a friend indeed, and China is a true friend for the Laos". The Laos will make full use of China's relief supplies to help the people in the flood-hit area to return to normal production and life at an early date. Q: US Secretary of State Pompeo has warned that the bailout funds provided by the International Monetary Fund (IMF) to Pakistan should not be used to repay loans that Pakistan got from China. Do you have any comment on that? A: I think that the IMF has its own standards and rules when cooperating with relevant countries. We believe that they will handle it in an appropriate manner. Q: According to reports, after the election in Cambodia, the US and the EU cast doubts, saying that the election is not competitive and inclusive and short of credibility because the main opposition party was excluded. The US also threatens to impose visa restrictions on Cambodia. What's your comment? A: In fact, over the past few days, I have made clear China's position on the general election in Cambodia many times. Now that you raised the question again, I would like to take this opportunity to once again congratulate Cambodia on the successful running of the new National Assembly Election and the Cambodian People's Party led by Chairman Hun Sen on winning the election. The general election belongs to Cambodia's domestic affairs. The international community should respect the choice made by the Cambodian people, and play a constructive role in helping the Cambodian government and people maintain social stability and promote national development. Q: Firstly, the ROK media reported that Yang Jiechi, member of the Political Bureau of the Communist Party of China (CPC) Central Committee and Director of the Office of the Foreign Affairs Commission of the CPC Central Committee visited the ROK. What topic did the two sides talk about? Did they discuss China's participation at releasing the declaration on the end of war on the Korean Peninsula? Secondly, the US, Japan and Australia announced that they would increase their investment in the Indo-Pacific region. What is your comment? Do you think that it is challenging the Belt and Road Initiative proposed by China? A: With regard to your first question, not long ago, Yang Jiechi, member of the Political Bureau of the Communist Party of China (CPC) Central Committee and Director of the Office of the Foreign Affairs Commission of the CPC Central Committee traveled to the ROK upon invitation, during which he held talks with ROK National Security Adviser Chung Eui-yong. The two sides exchanged views on China-ROK ties and other issues of mutual interest. Regarding your second question, I have noted relevant reports. It is a good thing that the US, Japan and Australia are willing to increase their input in the infrastructure building of the region. If my memory serves me correctly, this is not the first time for them to make this statement. As a Chinese saying goes, "talking the talk is not as good as walking the walk". We hope that the three countries can make substantial financial contributions and take more concrete steps to enhance the connectivity of the region and help the regional countries with their development. 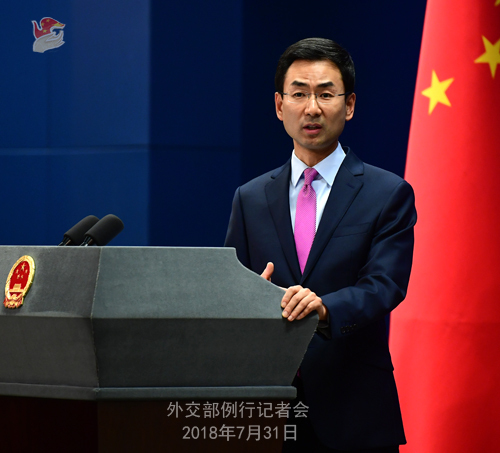 The Chinese side is willing to continue to follow the principles of openness, inclusiveness and win-win cooperation to maintain communication and coordination with all relevant parties and make concerted efforts with them to enhance the connectivity and promote the economic growth of the region. All like-minded countries are welcome to take part in the Belt and Road Initiative. Q: Yesterday, US Secretary of State Pompeo said the US was increasing investment in Asia to counter China's Belt and Road Initiative, and today State Councilor and Foreign Minister Wang Yi is in Malaysia to discuss China's partnerships there. Will China change its investment strategies in the region in response to the relevant measure taken by the US? A: Just now I have given you a clear-cut response. If the US and other countries are willing to increase their input in promoting the infrastructure building and connectivity of the region, we welcome that with an open and inclusive attitude. We hope that they can make substantial financial contributions and take more concrete steps to truly contribute to the welfare of the people in this region. China is willing to work with the relevant countries, including the United States to contribute to regional peace, stability and development. Q: State Councilor and Foreign Minister Wang Yi is visiting Malaysia today. What are China's expectations for this visit? He will attend the Foreign Ministers' Meetings on East Asia Cooperation. What are China's expectations for the outcomes of these meetings? A: Last week I released the information that State Councilor and Foreign Minister Wang Yi would visit Malaysia and Singapore and attend the Foreign Ministers' Meetings on East Asia Cooperation in Singapore. I also took relevant questions then. Malaysia is a friendly neighbor and an important cooperative partner for China in the region. China-Malaysia relations have been growing well in recent years as evidenced by the strong desire demonstrated by our two sides for cooperation and the ever deepening bilateral cooperation. We stand ready to further expand and deepen cooperation in various areas with the Malaysian side. During State Councilor Wang Yi's visit to Malaysia, he will have an in-depth exchange of views with the Malaysian side in this aspect. Regarding State Councilor Wang Yi's attendance at the Foreign Ministers' Meetings on East Asia Cooperation, he will expound China's propositions on promoting East Asia Cooperation and demonstrate China's willingness to join hands with other regional countries to safeguard regional peace and stability and promote economic growth. State Councilor Wang Yi will also hold bilateral meetings with his counterparts of relevant countries on the sidelines of these meetings. 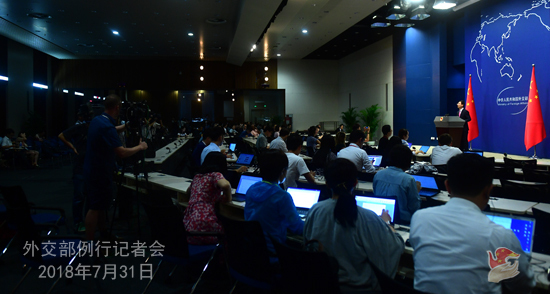 The Chinese side will issue the relevant information in a timely manner. Q: There are reports which suggest that the US has detected renewed activity near to the DPRK factory that once produced the country's first intercontinental ballistic missiles. Does China have any information about it? What is your comment? A: I am not aware of the situation mentioned by you. China's position on the Korean Peninsula issue is consistent, clear-cut and well known to you all. So I will not repeat it here. I want to stress that recently the situation on the Korean Peninsula has been stabilizing and showing a sound momentum. We hope that all relevant parties can make joint efforts to sustain this momentum. We especially hope that the US and the DPRK can follow through on the consensus reached during the summit, continue to meet each other half-way and play their part in realizing the denuclearization of the Korean Peninsula and politically resolving the Korean Peninsula issue. Q: There is information that Taiwan leader Tsai Ing-wen is going to visit Paraguay and Belize next month, and she plans to "transit" in the US during the trip. Does China have any comment on that? A: The one-China principle represents the universal consensus of the international community. Any attempt to create "two Chinas" and "one China, one Taiwan" will be opposed by all Chinese people and it does not serve the fundamental interests of the people in Taiwan. We urge the Taiwan authorities to get a clear understanding of the situation, come back to the "1992 consensus" as soon as possible and refrain from taking any actions that go against the trend of the times and run counter to the will of the people. As to the so-called "stopover" made by the Taiwan leader in the United States, the Chinese side has made clear its position many times and lodged stern representations with the US side. We are always opposed to arranging such kind of "stopover" on the part of the US and other countries that have established diplomatic ties with China. This position is consistent and firm. 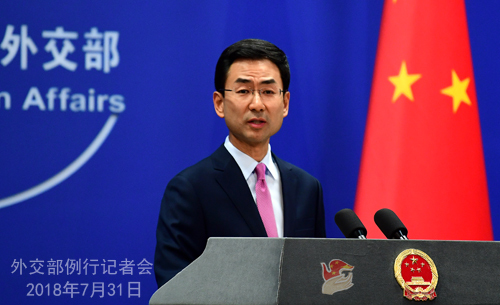 We urge the US side to abide by the one-China policy and the principles stipulated by the three China-US joint communiqués, not to allow the Taiwan leader to "transit", refrain from sending any wrong signal to the "Taiwan independence" force and uphold the overall picture of China-US ties and the peace and stability across the Taiwan Strait with concrete actions.